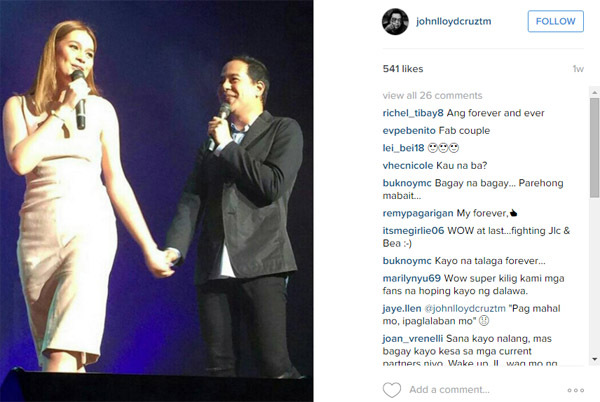 FHM Investigates: Are Bea Alonzo And John Lloyd Cruz Now A Couple? 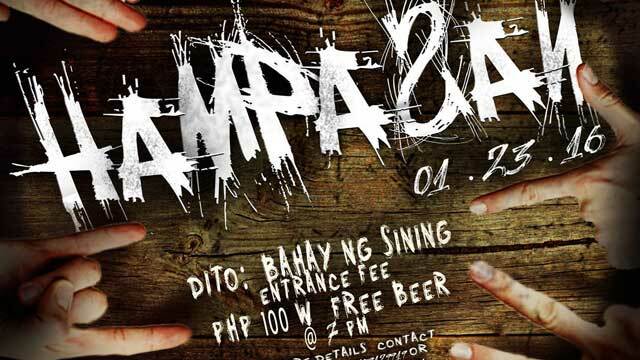 We gather and decipher the clues behind the rumors of a Popoy-Basha real-life hookup. Bea Alonzo and John Lloyd Cruz form one of the most popular love teams in local showbiz. For more than a decade now, they've been exuding a meant-to-be aura on TV and in movies. However, the two have also claimed time and again that they have never, ever fallen in love with each other. Recently though, rumors have emerged that the two are possibly—wait for it—now a legit couple. And because we're fans of One More Chance and A Second Chance, well, you know what we did. In this latest edition of FHM Investigates, we attempt to decipher the real score between Popoy and Basha. Last January 13, Mo Twister tweeted that, according to TV5 entertainment reporter MJ Marfori, Bea and JLC are now a couple. And allegedly, an "overlapping" occurred since both of them were known to be in different relationships. However, in an interview with PEP.ph, Marfori said Mo misquoted her. "Ang sabi ko, from the grapevine, ALLEGEDLY, pinag-uusapan na sa mga pahayagan na wala na nga raw sina Angelica and John Lloyd, and kumakalat na nagkaka-develop-an na sila ni Bea. Nagulat na lang ako na bigla siyang nag-tweet ng ganoon," she said. The Tubig at Langis actor has confirmed that he and Bea have called it quits in an interview with ABS-CBN's Tonight with Boy Abunda. Speaking to Boy Abunda, Zanjoe nearly shed man tears after he admitted that he is no longer with Bea. Asked how he was coping with the heartache, he said: "Wala naman madaling way so kailangan talagang pagdaanan." The two were together for more than five years. According to gossip blog Fashion Pulis, rumors have it that John Lloyd and Angelica broke up due to lack of time for each other. 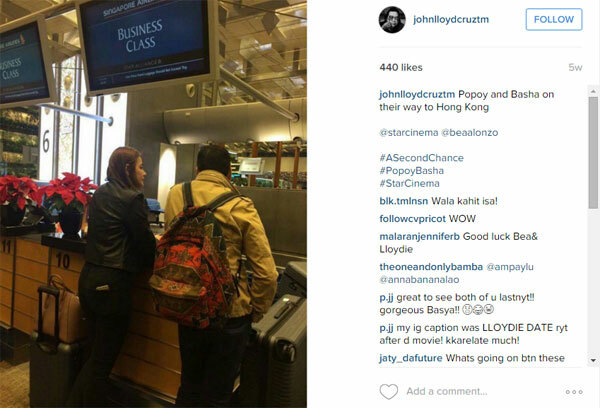 The alleged closeness of John Lloyd and Bea was also cited as another reason. Bea and John Lloyd "caught dating"
Bandera has reported that Bea and John Lloyd were seen "nagsusubuan" during dinner. However, no details were disclosed regarding when and where it happened although the online Taglish tabloid also said that their relationship is an open secret to close friends. And what do we think? We won't jump the gun just yet on their rumored romance, but the evidence we've seen so far seem to point to a Basha-Popoy real-life love team. 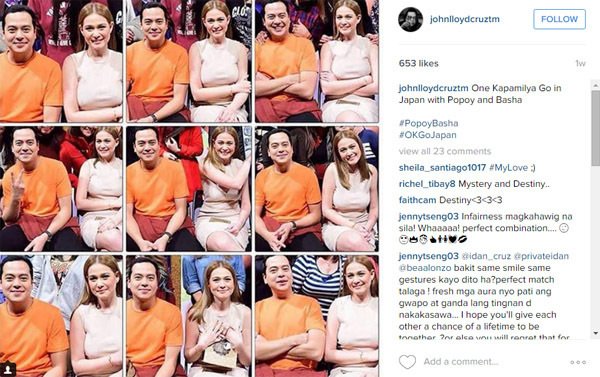 And though it's not good to assume, our man JLC seems to be dropping hints on his Instagram account. —Zanjoe and Bea's break-up was allegedly caused by a third party (on Zanjoe's side). Bea found about it. —Broken-hearted, Bea supposedly found a shoulder to cry on, her longtime friend John Lloyd. —The rest, as they say, is (lover boy) history. We'll still be waiting for a confirmation though. Until then, well, how about a Bea-JLC movie marathon with chips and beer?